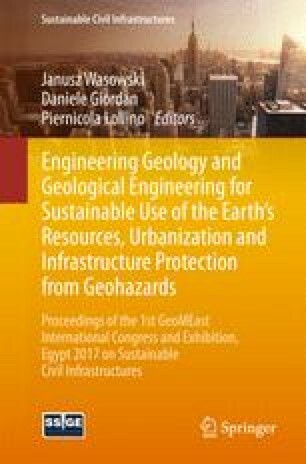 This study aims to investigate the geotechnical properties of expansive clay shale in El-Mahrousa region, Qena, Egypt. For this purpose, two sites were chosen and three undisturbed samples were taken within the active zone at depths 1.0 m, 2.0 m and 3.0 m below the ground surface for each site. Different laboratory tests were carried out including, natural water content, natural dry density, grain size distribution, Atterberg limits, unconfined compressive strength, free swelling test, swell potential test and swelling pressure tests. These tests were supported by chemical and mineralogical investigations such as X-ray diffraction (XRD) and X-ray fluorescence spectrometer (XRF). The main results of this study that there are various forms of empirical equations have been proposed which relate swelling indices to certain physical properties of soils, such as chemical components of clay, consistency limits (liquid limit, plastic limit and plasticity index and linear shrinkage which are well help geotechnical engineers to predict the behavior of expansive soil from it’s physical properties. Greatly thanks to all members in the Mining and Civil Engineering Department, Faculty of Engineering, Al-Azhar University, for their valuable cooperation that was highly needed during the conduction of this study.